With the nation's eyes on party conventions in Tampa and Charlotte, the media is cramming to get a handle on the Southern political landscape. The resulting punditry has ranged from thoughtful analysis of changes in the South to rants blaming the region for all (or most) of the nation's ills. The South is the fastest-growing region in the country. According to the 2010 Census, half of the states with the biggest percentage increase in the country over the last decade were in the 13-state* Southern region. And while states in the Mountain West had similarly large percentage increases, Southern states are bigger and had larger increases in total numbers. That trend appears to be continuing: The Census Bureau estimates that the states adding the most people between 2010 and 2011 were Texas (529,000), California (438,000), Florida (256,000), Georgia (128,000) and North Carolina (121,000). With growth comes political clout. Southern states gained eight Congressional seats and Electoral College votes in post-Census redistricting and reapportionment. 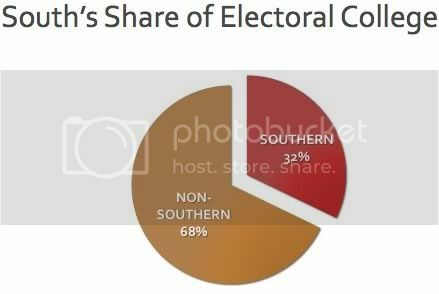 Today, nearly one-third of the total Electoral College votes needed to be elected president come from Southern states -- and that share will likely grow in the future. In other words, bypassing the South (for Democrats) or taking the region for granted (for Republicans) is not an option for any party interested in a winning political strategy. That's why the parties are holding their convention in the emerging Southern battleground states of Florida and North Carolina. * New Immigrants: Nine of the 12 states with the fastest-growing Latino/Hispanic populations in the 2010 Census were in the South. The political clout of Latinos is clear in a state like Florida, where Latino eligible voters increased by two-thirds over the last decade and now make up nearly 17 percent of the state's voters. But the Latino electorate is also growing in North Carolina, with registrations doubling since 2008 and making up two percent of voters -- enough to sway a close election. * The Black Belt: Half of the nation's African-Americans live in Southern states. An under-reported story of the 2010 Census was the growth of black communities in the South -- including an acceleration of return migration from cities in the North and Midwest. The growth is especially clear in cities: Six of the 10 urban areas with the biggest increase in African-Americans were in the South, including Charlotte (number six, 121,500-person increase) and two in Florida (Miami, where the black population grew by 191,700, and Orlando, by 100,600). * The "Majority-Minority" South: Growing Latino and African-American communities are pushing hundreds of Southern counties towards so-called "majority minority" status. (It's not just those two groups: North Carolina, for example, had the third-biggest increase in Asian-Americans over the last decade.) The number of majority-people of color counties is projected to double over the next generation, a dramatic shift that will make the South increasingly competitive politically. * The Urban South: Another big change in the Southern electorate is the growth of Southern cities. The 2010 Census showed that, in the South as elsewhere, populations moved to the metro areas. These are now centers of a more diverse, younger and growing South that will increasingly shape the region's political future. The paradox: Even while cities grow, the South (like the upper Plains West) still tends to be more rural than the rest of the country, creating a growing divide between urban and rural voters. So even though most of the population growth in North Carolina, for example, has been clustered in counties around Charlotte, the Triad and the Triangle, the still-large rural vote was key in the state's recent passage of an anti-gay marriage amendment. 4) THE FUTURE OF "THE NEW MAJORITY"
Every state in the South is seeing demographic transition, just at different speeds and to different degrees. Combined with the growth of urban areas and different industries, the question isn't if the South's electorate will change, but when it will affect each state. * Voter ID laws in Mississippi, South Carolina, Tennessee, Texas and other states are facing fierce resistance -- and effective court challenges -- because of the disproportionate impact they could have on historically disenfranchised voters. * The ultimate impact of redistricting after the 2010 Census has been to dillute the overall power of African-American and Latino voters, thinly spreading them in most districts and hyper-concentrating them in others. * Anti-immigrant legislation spearheaded in Alabama, Georgia, Mississippi and other states has appeared to have a chilling effect on new immigration into targeted Southern states, momentarily slowing -- if not ultimately changing -- their demographic transitions. In 2012, the ability to mobilize -- or block -- such key constituencies from voting could mean the difference in battleground states like Florida, North Carolina and Virginia. And in fast-changing states like Georgia, Mississippi, Tennessee and Texas, these trends will shape the balance of power for decades to come. * The Institute includes the following 13 states in its definition of the South: Alabama, Arkansas, Florida, Georgia, Kentucky, Louisiana, Mississippi, North Carolina, South Carolina, Tennessee, Texas, Virginia and West Virginia.